Scanning of product barcodes at a retail POS counter is a common sight. Barcodes make checkout experience faster and serve as unique product identifiers. While every product has a unique barcode, there are certain products that are also sold in various packs of different quantities. For example, in bakery retail eggs are sold in packs of dozen, or six eggs. Similarly, book stores can sell stationery items like pencils in various packs, etc. To keep your checkout experience efficient you should be able to easily identify and select various packs of the same product while selling. How do you do this? Alternate Nested Barcode is the answer. Nested barcode feature helps you assign different barcodes to various packs of the same product while keeping them attached to the main product. Let’s learn how to create and use Alternate Nested Barcodes in Candela Retail POS. To be able to use the nested barcode feature, first, go to System Configuration>Product/STR and mark the checkbox ‘Enable Nested Alternate Barcode.’ Now you will have access to a new tab on the Product Definition screen called Nested Alternate Barcode. Now move on to the next step. To create nested barcodes for various packs of a certain product, select the main product on the Product definition screen and click into Nested Alternate Barcode tab. 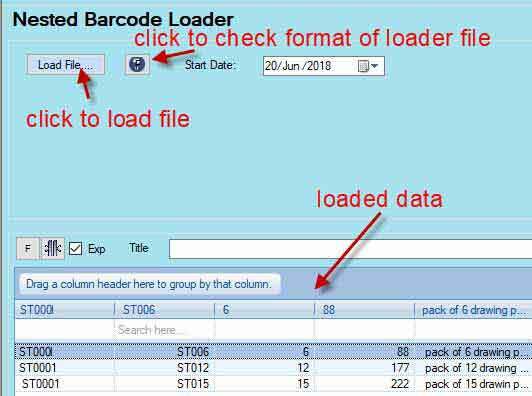 And, in Barcode column enter whatever barcode you want to assign to a certain pack, enter quantity in the pack in Qty column, add price and description for each pack, and save. Once all Packs are defined on this screen, they will appear as separate products on the sales and return screen with their respective barcodes and can be scanned individually. Candela inventory software allows you to generate and print nested barcodes to use them on the products. All you have to do is this: Go to Utilities>Product Utilities>Selected Barcode Generator, select the Line item, select the main product, mark the checkbox Nested Products, and click Generate Report. All nested products of the selected item will load in the grid. All Nested products will be listed in the product code help. You can select/scan and sell them. When you sell nested products, the sales receipts will show these products by their names. For example, if an egg is your main product and you have defined its different packs as nested products and given them different names, the sales receipt will show names of the nested products. This will help your customers see what exactly they have purchased. Like any other product, you can easily set customer type based prices for Nested products. Go to Configuration>Misc>Customer Type Based Product Prices. On the screen click into Customer’s Type Based Nested Product Prices tab, select Customer Type, click Generate button and from product help field select the master product. All Nested products will load in the grid. Enter new price against each nested product and Save. Nested Alternate Barcode feature is designed to make retail super easy for businesses who sell certain products in various packs. Being able to create barcodes for various packs of the same product and also sell them individually is hugely convenient. Have you used the Nested Alternate Barcode feature? What type of products do you use it for? You can share your thoughts in the comment section below. Currently, master product name is displayed on scanning of nested product but on sales receipts, Nested Product Name will be displayed.